Things to do in Torrevieja in the winter – is this the perfect day out? Christmas and the weeks leading up to it can be magical anywhere, especially if you get to experience wonderful things to do. In Torrevieja, you’ll find plenty to suit all tastes. Whether you want to spend an afternoon on the beach, take evening walks with a sensational sunset as a backdrop, do a little shopping ahead of the big day, or take the kids out for the day, this part of Spain offers it all. 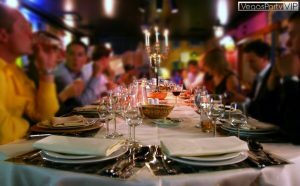 And to top it off, you can eat in style at a more than reasonable cost in one of many fantastic restaurants in Torrevieja. Many people visit Torrevieja and its neighbouring areas every winter. December through to after Three Kings Day (January 6th) is especially popular. We have the weather, of course, which always helps. We also benefit from nearby attractions, which include Rio Safari at Elche, Benidorm Palace, and the Roman Theatre at Cartagena. This little region of the Costa Blanca is said to have its own microclimate. Perhaps it’s the shelter given by the surrounding mountains. Maybe it’s the minerals from the salt lakes. It could be our proximity to Africa, a short hop across the Mediterranean. Whatever the reason, even around Christmas it’s often warm enough to spend time on the beach. The sun rises around 7:30, and that’s when I like to get out of bed. I have a shower, a cup of tea, and then spend half an hour catching up with the news from the UK. That always makes me feel better. Cold winds, snow, and traffic jams! Not here! My wife and I generally take a morning stroll along the coastal path, from La Zenia to Cabo Roig. At Cabo Roig, we have a selection of places to have a spot of breakfast. Our favourite is ‘El Paradiso’, a Spanish coffee shop. 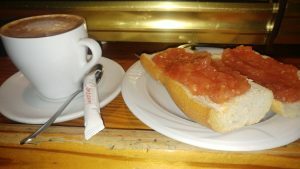 Excellent coffee, accompanied by a traditional tostada, with ‘tomate y aceite’ – tomato and olive oil. Sets us up for a slightly brisker walk back to La Zenia. This time of year is fantastic for residents and tourists who want to get a colour, without baking. There is still a lot of strength in the sun, and very few people on the beach. We get a spot out of the gentle breeze, and spend the afternoon soaking up a few rays. A light lunch of pan (bread), Manchego cheese, and serrano ham is washed down with a glass of vino. Good company (the wife) and a good book complete the perfect afternoon. We tend to leave the beach at around 4pm in the winter. This gives us enough time to return home, shower off the sand, and dress for dinner. This evening, we chose to come to Christopher’s, as we wanted to treat friends to a special meal. They return to England tomorrow for Christmas with their grandchildren. At Christopher’s we’re always given a warm welcome. Tonight, we chose our meals from the á la carte menu. The ladies enjoyed lobster, while us men ‘suffered’ with succulent sirloins. A bottle of red for the men, and a bottle of white for their better halves. Homemade Bailey’s cheesecake all round. After dinner, we took a wander around La Zenia Boulevard. Only window shopping. My wife suspiciously pointed out several items – perfume, a leather jacket, and a pair of boots – that she said were all ‘very nice’. After a nightcap at our local bar, it’s home and to bed. I spent half an hour finishing the book I hadn’t completed at the beach earlier today.